Portrait of Woman at LifeCycle Ride. I have been an avid cyclist since the early 90’s. A couple of my most memorable rides have been during the Aidsride/Lifecycle rides – week long fundraising rides that started in San Francisco and ended in Los Angeles. In 2002, the ride was transitioning from “California AidsRide” to the new “LifeCycle Ride” (the change was due to disagreements between the principle organizer – a for-profit company – and the recipient organizations, and is a story in itself). I volunteered to photograph the event. I had done the ride twice in the past and felt that I could really bring out the stories of both the ride and the inspirational people that participated. On third or fourth morning of the ride, I wanted to set up and do a number of portraits before the riders left for the day, and again when they finished. I awoke to find low overcast clouds, and a slight mist in the air. The low angle, early morning light that I was hoping for was nowhere to be found. Deciding to make the best of the situation I took my photo gear over to where the bicycles were parked each night and waited for riders to come over and start saddling up for the day. I had brought a Norman 400B battery operated strobe with me, along with a small/medium soft box. I set that up camera left, and adjusted it until my meter (this was back in Analog Times) told me that I had a 1:2 ratio. The strobe was set fairly low, as I just wanted enough to give me a bit of ratio on the people, but I wanted to use a small (numerically) aperture thereby allowing the background to go out of focus. 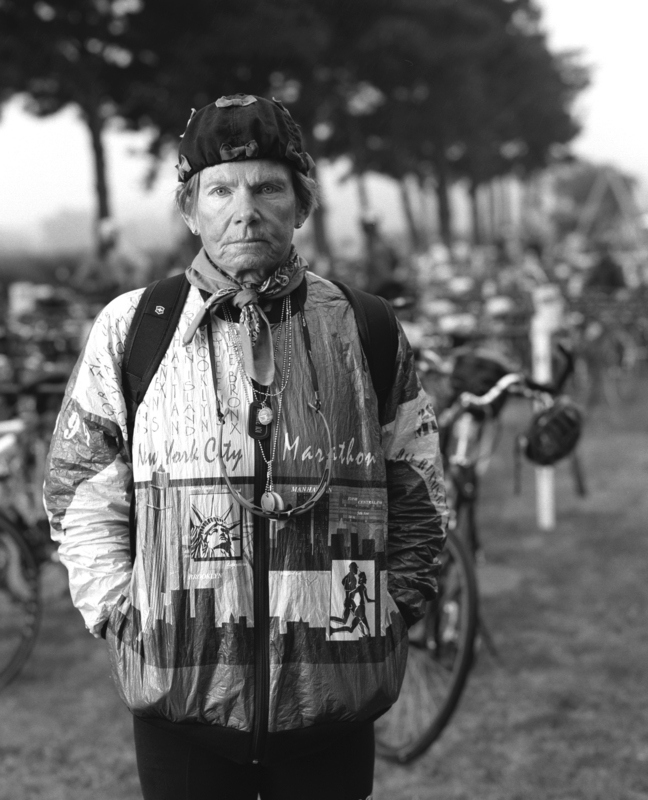 I photographed a few people as they were getting to their bikes to start the day’s ride. As I was in the middle of one of these, I saw a woman in the background that I knew I had to photograph. I quickly finished up with the person that I was with, and jogged down to where this woman was rolling her bicycle out towards the finish line. After quickly explaining who and I was and what I was doing, I asked her if I could photograph her. In the crustiest of voices, she replied “As long as it doesn’t take very long”. I thanked her profusely, and led her over to where my camera and light were set up. I immediately knew that I wanted to use black and white to really bring the focus in on her face. A color image would have been too distracting, and brought the viewers eye’s to various splotches of color rather than where I wanted it. I switched out cameras (I had been shooting color for the earlier portraits), and had her stand in front of my camera. “No smile, look straight at the camera, and tilt your head just a touch this way” I replied. I took one exposure, and without saying a word she turned and walked away. Glacial Fragments at Jokulsarlon, Iceland.